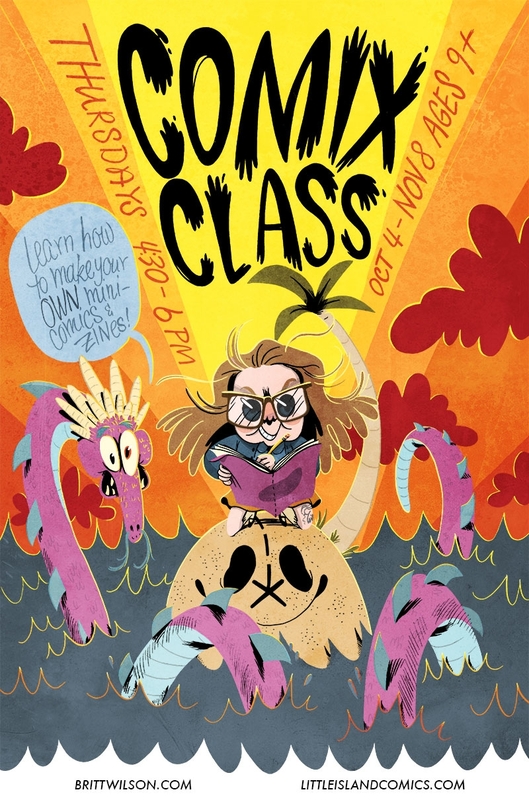 CANCELLED: After-School Comix Class with Britt Wilson! « Little Island Comics – The Blog! Anouk Ricard at Little Island Comics! Legendary Children’s Book Illustrator Tomi Ungerer In-Store Sat Sept 8! CANCELLED: After-School Comix Class with Britt Wilson! We regret that we have had to cancel the Thursday after-school comix class. We’re looking to book some more classes in the future, and we hope that you’ll keep checking out our site for details! Are you a kids who’s at least nine years old? Do you want to learn all about making your own comics and zines? You should get your parent, guardian, or pertinent adult to sign you up for Britt Wilson’s fall after-school comix class!!! For six weeks, Britt will take you through the steps of making your own mini-comic! It happens Thursdays from 4:30 to 6pm, from October 4th to November 8th. All materials (and also snacks!) will be provided. The cost for the course is $120 (only $20/session), and not only will you get tons of comix-making skills and your own mini-comic, but also a $20 Little Island Comics/The Beguiling gift certificate to spend! Space is limited, so sign up as soon as you can!!! Call or email us to reserve your spot. Or head on in to sign up in person!